I find the concept of superfoods irresistible. Forget deprivation, elimination of entire food groups, and/or the tricking, smashing, and brain-washing of fat cells. Instead, fill your life, and your bowl, with foods loaded with super-levels of nutrition and taste; these superfoods will make you feel good, look great, and rejoice, rather than despair, come breakfast, lunch, and dinner. Several best-selling books on the topic may go too far, ascribing superfoods with fountain of youth qualities that stretch the boundaries of reality, but the fundamental science is well-supported by leading nutritionists across the board. What I find most exciting about the notion “superfoods,” though, is it goes beyond nutritional science and enters the realm of social science, by offering a new way to conceptualize eating good food, and some simple how-tos for putting the knowledge into practice. Most of us learned in kindergarten that eating fruits, vegetables and whole grains makes good sense; the lesson is reinforced for the remainder of our lives. It sounds so simple, and it would be: if we were robots. But instead we’re temperamental, unpredictable, social beings, and that makes all of our choices and activities—like eating—complex. So while I like to keep up to date with nutritional news, recommendations and breakthroughs, I rarely begin a meal with the acuity of a scientist. I eat what I crave, and what I think will make me feel good (satisfied, comforted, relaxed, energized). And that’s where I see the superfoods concept as helpful. It gives good food a fresh identity (i.e., eat more of these foods because, well, they’re super in every way and they make you feel super). Not health food, not diet food, not punishment, not restriction, but superfoods, my friend. As in Superman, Superhero, Superstar, Super-Duper, and the Superfriends hall of justice. I think the symbolic shift is key in the little choices I make in those split seconds each day: hmm, perhaps I’ll put some spinach on my sandwich, eat a cup of yogurt for a snack, or nibble a bit of really good chocolate. Not because I should, or because I’m on a diet, or because I’m punishing myself….but because I want to, it’s doable, it tastes wonderful, and (how about that) it makes me feel great, too. Huh; who knew being trendy could be so delicious. Antioxidants. A general term for a wide range of substances that slow the body’s normal process of oxidation, meaning a reaction to oxygen that releases “free radicals” that damage cells and break the body down. Digestion releases free radicals from food. Antioxidants help prevent this and also are thought to destroy free radicals and slow oxidation, reducing allergies, heart disease, cancer and aging effects. Dozens of antioxidant nutrients have been identified so far, and there are likely many more. Many vitamins have antioxidant effects, including A (which is a carotene), C and E.
Flavonoids. Perhpas the best-known, most touted antioxidants (tea and dark chocolate are chock full of them) among a group called polyphenols. Flavonols, a subgroup of flavonoids, is also used. Relatives are anthocyanins (which give blueberries their claim fame). Carotenoids. These are the pigments that protect dark green, yellow, orange and red fruits and vegetables from sun damage; they work as antioxidants in humans, too. Beta-carotene (also called Vitamin A) is the best known. Other famous carotenoids (there are many dozens) are lycopene and lutein. Vitamins. Nutrients considered essential to health; a shortage of vitamins can create health problems. Phytonutrients. Plant-derived compounds that are believed to improve your health, but aren’t essential to your health. An example is areservatol, a phytonnutrient found in red wine that has cancer-fighting properties. Hoisin sauce is the Chinese equivalent of bbq sauce—it adds tremendous flavor to these wraps, giving them a taste similar to Peking duck. You’ll find it where soy sauce is shelved in the grocery store. Combine the turkey and 2 tablespoons of the hoisin sauce in a medium microwave-safe bowl. Heat 30 seconds until warmed through. Place the tortillas on a dinner plate and heat in microwave 15-20 seconds until warm. Spread the tortillas with the rest of the hoisin sauce, then use to wrap up turkeywith the cucumber, onions and watercress. Cut in half and enjoy while still warm. Makes 2 servings. Calories 232; Fat 6.9g (sat 1.1g, mono 2.3g, poly 2.7g); Protein 18.2g; Cholesterol 32mg; Carbohydrate 29.8g; Sodium 741mg. (2) Vegetarian option: use well-drained, extra-firm tofu (as is, or quickly pan fry first), cut into strips, in place of the turkey. Spinach, Green Onions and Cucumber: All three are “green foods,” and as such have marked beneficial effects on cholesterol, blood pressure, immune response and cancer prevention. These effects are attributed in part to their high concentrations of chlorophyll. Chlorophyll, the phytochemical that gives leaves, plants and algae their green hues, is the plant equivalent of the oxygen-carrying red pigment hemoglobin in red blood cells. Dietary chlorophyll inhibits disease bacteria and exerts therapeutic effects on bad breath and internal odors. Lean Turkey: Skinless turkey breast is one of leanest meat protein sources available. It also offers a rich array of nutrients, particularly niacin, selenium, vitamins B6 and B12, and zinc. These nutrients are heart-healthy and are also valuable in helping to lower the risk for cancer. The wrap looks so delicious! Hoisin sauce has been sitting in my pantry for a month waiting to be experimented with. I think I now have a reason to unrap the plastic and give it a try. Whoohoo! I’m all about making someone’s day through cyberspace. Your lunch sounds delicious–and very superfoodie. You may have to don a cape and some spandex. Ah yes, Nick and eating. He goes through phases of being willing to try a little of this or that, then the next the next day he won;t even touch buttered noodles. I keep trying by offering little bits of what we’re eating, but he is strongly in the plain food camp about 90% of the time these days. The ketchup thing is a nice trick, but what I am always puzzled by is Jack’s (my almost 2-year old) ability to just look and sniff a red tomato-based sauce, and know that it is not ketchup, but spaghetti sauce for example, and therefore not edible. I’ll give this a try soon, the recipe, that is. This sounds so good! And a great change from the typical turkey sandwich. When you buy roasted turkey or chicken- I assume you are buying it with the skin on? Do you keep it on? Also, do you typically buy pre-washed lettuces. I find it is such a time saver, but I know they must put chemicals on it to clean the lettuce. I love reading about all those super foods. It always gets me motivated to use them more. My husband is on a health kick right now, so I think I’ll go make some super food!! Those wraps look incredible, YUM!! 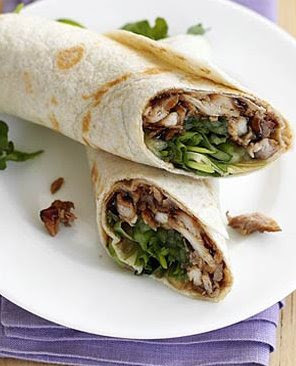 Yummy wrap recipe! Loved the superfoods post. Great info! This sounds like a great and easy wrap. I’m always looking for quickie new (and healthy) lunch ideas to make for hubby. I love hoisin sauce but I don’t think I’ve thought to pair it with turkey. Delicious! I think Nick andJack must have the same radar–he knows as I’m heading towards him with something new 🙂 I try to persevere, but it can be so exhausting, yes? oh, and you could so wear that spandex! Yum! I’ve been looking for some easy, yummy things to jazz up my lunches and that wrap sounds like just the thing. I love hoisin sauce! What a great way to characterize superfoods. Just imagine a blueberry with a little cape…. Awesome…I’ve been reading about the superfoods! I say, let’s skip right to the red wine and….say!…isn’t chocolate a superfood, dagnabbit!?? Hope you liek it. I visited your blog, too–it is WONDERFUL! I already envy you for being a digigirl–I feel like I can barely type some days 🙂 Digitally savvy I am not, I just do what I can do . Anyhoo, you’ve had me thinking of caped berries all day long! Oh heck yes, chocolate is definitely a superfood. It has more antioxidants than almost any other food (excpet the acai berry–I’ll have to check , it still may have more than that). Whoohoo! The little glossary of superfood terms is really useful! Hi Nicole! So glad you found the glossary helpful. It was a useful exercise for me, too–so many terms get thrown around in medical and science news that I get used to hearing them, but realize I do not know what the heck they are talking about. These look so good! I love your note on how to make it to go. This would certainly be a nice change-up for my husband’s brown bag. Thanks!